Buy 21 or more for $5.69 each. Seek and ye shall find! Celebrate your faith and enrich your free time with these 100 word search puzzles, which include terms and phrases about biblical people, places, and events as well as quotes from favorite stories, hymns, and proverbs. This inspiring collection offers the perfect way to review and enhance your knowledge of both the Old and New Testaments. Highlights include selections from Jonah's Prayer, Psalm 27, stories of David and Goliath, the Last Supper, and many other notable Scriptures. Complete solutions are provided in the back of the book. Mary Carolyn Waldrep, formerly Dover's Editor-in-Chief, specializes in books on needlework, crafts, fashion, electronic clip art, and interactive adult activity books. 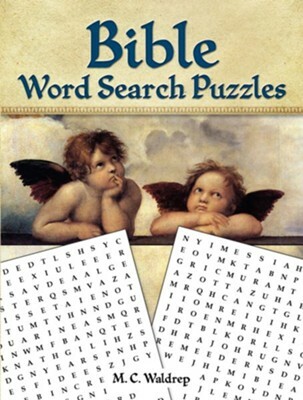 I'm the author/artist and I want to review Bible Word Search Puzzles.